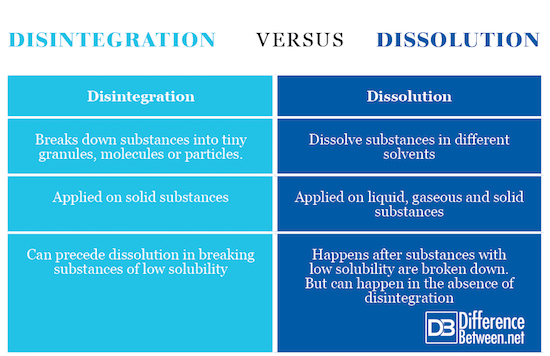 Dissolution and disintegration are the two common processes mainly used in pharmaceutical and chemical industries to break the intermolecular and intra-molecular forces that hold substances together. This attempt is done for quality purposes to improve the solubility and bioavailability of, for instance, pharmaceutical drugs into the blood stream. The article discerns the confusion of the difference between these closely related processes. 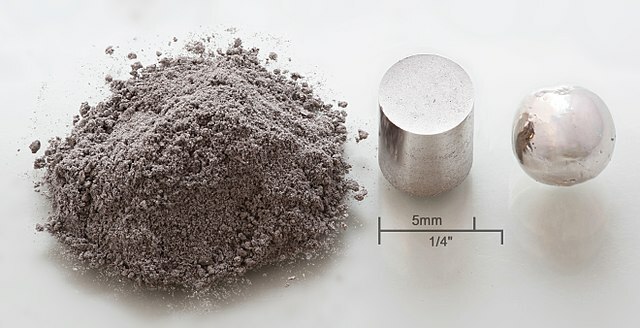 To disintegrate a substance involves breaking it into small chunks, particles and molecules. Disintegration is a process with which substances are broken down into tiny fragments to improve their solubility. Compounds are disintegrated in chemical reactions. At times the process of disintegration can integrate with dissolution where a solid substance disintegrates into small pieces while dissolving in a solvent until it forms a uniform solution of the solute and the solvent. In the pharmaceutical industry, there is a disintegration test undertaken on drugs to make them ready for absorption into the blood stream. For any dosage to be absorbed by the body, it has to be in a solution. The disintegration process breaks down the drug into tiny fragments or granules to improve its solubility. Disintegration time is the time needed for the drug to break into fragments under certain conditions. Some disintegration tests are done with simulated gastric or intestinal fluid to see how the dosages will perform when ingested. This is the process through which solid, gaseous or liquid substances dissolve in a solvent to produce a solution. However, for the substances to dissolve in a solvent, both the solute and the solvent must be compatible. For instance, a polar substance may not dissolve in a non-polar solvent. Amongst other solvents, water is the universal solvent that is good in dissolving many substances. Gas solvents can only dissolve gas solutes. The solution formed by dissolution process is often a uniform one. There are factors that can expedite the dissolution and these include the temperature. Dissolution is a kinetic process, so the kinetic energy resulting from increased temperature will speed up the process of dissolving a solute in a solvent. The intermolecular forces of the solute will be broken with ease. If the solute and the solvent can absorb the visible light, the solution yielded can have color. For solid substances dissolving in a solvent, shaking and stirring can expedite the dissolution process. Other substances may not readily dissolve so they may need some manual breaking, and that is where disintegration comes in to break the substances into tiny chunks prior to the dissolution. Like disintegration and even more often, dissolution is a common process used in pharmaceutical industry in the manufacturing of drugs. A dissolution test is a normal standard required in the development of solid oral tablets. It helps in detecting any changes in physical properties of drugs, more especially the active pharmaceutical ingredient (API). The solubility of tablets in liquids is subject to the effectiveness of the dissolution rate. Some tablets readily dissolve without any full or partial disintegration. A tablet should also be permeable through the intestine walls to be absorbed into the blood circulation. Such factors prompt dissolution tests to be conducted regularly in drug developments. Poor solubility impedes the dissolution rate and bioavailability. In such cases disintegration is important to precede dissolution, and grind the substances. Disintegration is a process of breaking down a substance into tiny fragments to improve its solubility in a solvent. The process is used predominantly in pharmaceutical and chemical industries. Dissolution, on the other hand, is a process through which solutes dissolve in a solvent. Dissolution is also used predominantly in pharmaceutical industries to check how soluble a drug is in the body. The hardness, binders, fillers and lubricants are some of the factors that affect disintegration of the substance when breaking down the cohesive forces that bind it together. Temperature is a factor that can affect dissolution in a good way by expediting the process. The effects of fillers and binders can also affect the rate of dissolution of a particular substance. Both processes can be applied on the same substances. However, disintegration seems to be applicable on large solid substances. On the other side, dissolution can be applied on solids, liquids and gases. Gases can dissolve in gas solvents. A solid with low solubility may require disintegration first. Dissolution is process of dissolving solutes in a solvent. These solutes should be compatible with the solvent. Gas solvents, for example, may dissolve only gas solutes. Dissolution can be a form of disintegration as it also breaks substances into tiny particles. But, often, the solution yielded from dissolution is uniform and the particles cannot be observed with a naked eye. Disintegration may be needed to disintegrate tough solid substances that do not readily dissolve in solvents. Lusi Madisha. "Difference Between Dissolution and Disintegration." DifferenceBetween.net. June 4, 2018 < http://www.differencebetween.net/science/difference-between-dissolution-and-disintegration/ >. Abdelelah, A. Disintegration and dissolution tests. Accessed on 18 April 2017 at: https://www.slideshare.net/ameraabdelelah/disintegration-and-dissolution-tests.